For more than two decades, impoverished indigenous people have been seeking restitution from the oil giant for polluting their region. For more on Rafael Correa, see James North at TheNation.com. Correa’s outspoken comments are just one of the latest developments in a massive international legal case that has pitted 30,000 poor Ecuadorans who live in the rain forest against a corporation that reported $19.2 billion in profits last year—more than half of Ecuador’s entire government budget. The battle has already lasted 22 years, spanned several countries on three continents, and shows no signs of ending anytime soon. The American public is largely uninformed about this epic struggle, even though it’s as important as the dispute over the Keystone XL oil pipeline. The mainstream US media, when it hasn’t ignored the case, has often taken Chevron’s side, implicitly (and sometimes explicitly) endorsing the company’s view that an alliance of Ecuadoran extortionists and crooked US lawyers is using the corrupt Ecuadoran court system to shake down an innocent corporation. On closer inspection, the truth is totally different. If the plaintiffs finally win in the end, the rain-forest inhabitants will not just have their habitat start to be cleansed of the oil muck that oozes into their water supply, or enjoy improved health facilities to treat what they argue are elevated levels of cancer and other diseases. They will also have proved the success of an innovative legal strategy that recruits financial help in the rich developed world to provide at least a fighting chance against a corporate colossus like Chevron, which has already spent, by some estimates, $2 billion in its massive legal and propaganda campaign. But if Chevron prevails, it will be one more depressing proof that multinational corporations can defy national and international law and pollute with impunity. Here, as briefly as possible, is what has happened so far: Texaco left Ecuador in 1992, having disposed of its wastes by methods that in some cases would have been illegal, and in others unethical, in the United States. The company dumped a combination of drilling muds, “formation water,” and actual crude oil into unlined waste pits—a procedure that Texas outlawed back in 1969. It released billions of gallons of oil-laced “produced” waters straight into the streams and lakes, even though standard procedure in the United States was to “reinject” the potentially toxic compounds safely deep underground. In 1995, Texaco agreed to “remediate” part of the mess, which it later said cost $40 million. In 1998, Ecuador’s government certified that the purported cleanup had been successfully completed, thus relinquishing its right to bring further legal action. But popular movements in the rain forest that had already started organizing against Texaco’s pollution were outraged, charging that their government had sold them out. They brought their own lawsuit against Texaco in a New York federal court in 1993. Eventually, the plaintiffs would represent some 30,000 people, known as the afectados (affected ones) in Spanish. In 2001, Chevron took over Texaco. The oil giant’s lawyers were already fighting to dismiss the case in the United States and move it to Ecuador. 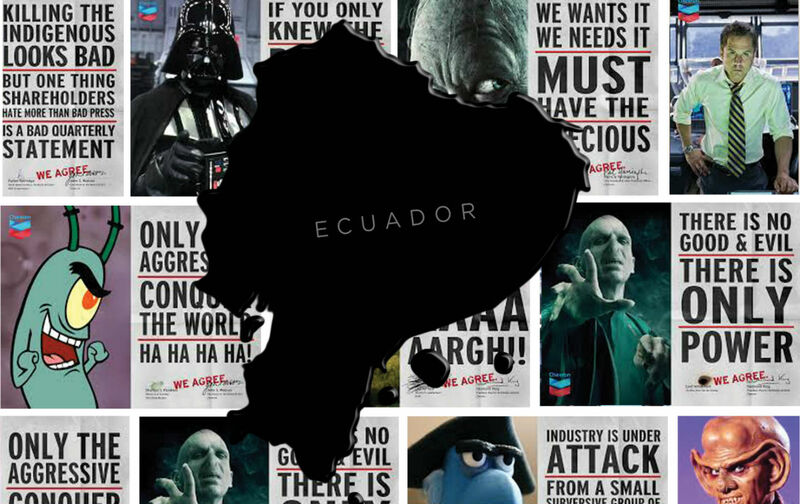 That same year, federal judge Jed Rakoff finally agreed, ruling that the case “had everything to do with Ecuador and nothing to do with the United States.” So, in 2003, the legal battle reopened in the eastern oil-frontier town of Lago Agrio. The Ecuadorans would soon be led by Pablo Fajardo, a young lawyer who had grown up in the region and lived through the contamination firsthand. In 2007, Chevron, probably sensing that the case was going against it, sold all of its assets in Ecuador—which now meant that even if the plaintiffs won a judgment, they would struggle to collect; they would be forced to bring lengthy and costly legal action in other countries where the company still had operations. Finally, in 2011, the local court found in favor of the rain-forest residents. The original judgment was for $19 billion. Chevron appealed to higher courts, and the case ended up in Ecuador’s National Court of Justice, which in 2013 reduced the judgment to $9.5 billion. The amount may sound large, until you consider that another major oil corporation, BP, has already spent $27 billion to clean up its 2010 Deepwater Horizon spill in the Gulf of Mexico, and could face an additional US fine of nearly $14 billion. By then, Chevron’s intransigence was drawing some unwanted attention in the financial world. A respected oil analyst, Fadel Gheit of Oppenheimer & Co., said in 2013 that the litigation was damaging the corporation’s stock price and encouraged it to settle. New York State Comptroller Thomas DiNapoli, who is responsible for some $540 million of Chevron stock in a state pension fund, had also pointedly suggested in 2011 that Chevron come to an agreement. Instead, Chevron launched a publicity counterattack. The oil giant’s home page includes a prominent banner linking to its views on the case. It ran large ads in print, on television, and online—not to encourage readers to buy its products, but to boast in general terms about its purported social and environmental conscience. Other tactics in Chevron’s onslaught were vicious, and historically unprecedented in their scope and intensity. In 2011, the corporation came back to a federal district courtroom in New York, this time before Judge Lewis Kaplan, and counter-charged a group of Ecuador’s lawyers and plaintiffs under the notorious RICO Act with “racketeering” and “fraud.” The corporation’s main target was Steven Donziger, an American attorney who had been part of the Ecuadoran legal team almost from the start. Here is where the Chevron/Ecuador legal saga becomes truly bizarre. After a three-year trial without a jury, a US judge, in a US courtroom, somehow found the predominantly Ecuadoran defendants guilty of fraud in the Ecuadoran courts, and then issued a legal injunction that would almost certainly prevent them from collecting on the judgment they’d won in Ecuador anywhere else in the world. Judge Kaplan did concede that “there is pollution” in Ecuador’s rain forest, and that “On that assumption, Texaco and perhaps even Chevron—although it never drilled for oil in Ecuador—might bear some responsibility.” But he insisted that his chief concern was the fraud that he decided had taken place in an Ecuadoran courtroom more than 3,000 miles away. It’s little wonder that legal scholars have been scratching their heads over Kaplan’s verdict. The US Court of Appeals for the Second Circuit, which had already reversed one of Kaplan’s earlier rulings in the Ecuador case, heard arguments from Donziger and his codefendants on April 20 of this year. Meanwhile, the Ecuadoran legal team remains undeterred: The plaintiffs are already taking action to collect their judgment in other countries. Canada, where Chevron has an estimated $15 billion in assets, is their first target, and a leading Canadian trial attorney is already fighting their case there. Chevron’s ferocious counteroffensive didn’t stop in Judge Kaplan’s courtroom. Even though Ecuador’s government is not a party to the lawsuit, President Correa denounced, in our interview, what he called Chevron’s “multimillion-dollar publicity campaign” against his country and its judicial system. He also criticized Chevron for bringing a case against his government at the Permanent Court of International Arbitration in The Hague, where the corporation alleged that its rights under the Bilateral Investment Treaty between the United States and Ecuador had been violated. Chevron’s demands are brazen: It’s asking the Hague tribunal to either order the government of Ecuador to quash the lawsuit brought on behalf of the 30,000 rain-forest residents, or to financially compensate the company for any verdict against it. I had, in fact, already visited the polluted rainforest zone three years earlier. My guide back then was Donald Moncayo, a serious, even somber man, now in his 40s, who belongs to the Amazon Defense Coalition, a popular organization that represents the 30,000 rain-forest afectados. Over the years, he had led several hundred of what he calls “toxi-tours,” but he hasn’t gotten tired, or lost his indignation at Texaco for poisoning his home area. He seemed to know many of the waste pits by name; he said there were 953. Our two-day tour started in Lago Agrio, the raw, ramshackle oil town 120 miles east of Quito that Texaco founded after it struck oil in the 1960s. Lago Agrio is a shabby place, with no sign that the oil boom had much local benefit. The courtroom in which Chevron first lost the historic decision is on the third floor of an unprepossessing building trimmed in yellow paint. Here are the tools of Moncayo’s trade as a toxi-tour guide: a machete to cut through the forest underbrush; a spade for digging up the shallower waste pits; a coring device for taking soil samples at other dumps, where the waste is more deeply covered up; and rubber gloves for when he does unearth the oozing poison. We set off into the rain forest. Oil pipelines of various sizes run alongside the roads; in one spot, you can count dozens of them, like strands of spaghetti. Moncayo uses the tour to rebut, point by point, Chevron’s main claims, such as blaming Petroecuador for the pollution. He started at Aguarico 2, a well that has been closed for years and that Petroecuador never operated. The oily residue is still floating on the surface. Then he marched down a steep slope to a stream, where you could see and smell the oil as well. Chevron’s supporters insinuate that the local people are the pawns of ambulance-chasing lawyers in the United States. Halfway through the tour, we crossed La Victoria River; people were doing their laundry as children splashed in the water. Moncayo explained that the fight against Texaco started there, back in 1986—not in the offices of US attorneys. He said that local people carried out a paro—a work stoppage and road blockade—to protest the pollution, then formed the grassroots organizations that launched the long campaign for environmental justice. During the two days of the toxi-tour, Moncayo regularly asked by name about cancer sufferers all over the area. The 30,000 afectados cite five peer-reviewed scientific studies that show an increased incidence of cancer and other health risks in the area; one article in the International Journal of Epidemiology reported on the “statistically significant higher rates of cancer found in people living in oil-producing areas compared to people living in similar regions of the Ecuadorian Amazon unaffected by oil operations.” (Chevron funded its own peer-reviewed study, which claimed to find no such increased cancer risk.) As Moncayo pointed out, “Our local hospital is not capable of diagnosing cancer properly, much less treating it. So we really don’t know how many cases there have been.” Some cancer patients have to travel all the way to Quito, or even farther, for treatment. Burt Neuborne, 74, is a nationally respected human-rights attorney who is also a professor at the New York University Law School. He’s appealing on behalf of Hugo Gerardo Camacho Naranjo and Javier Piaguaje Payaguaje, two of the Ecuadoran defendants who got snared in Chevron’s “racketeering” case against Steven Donziger in Judge Kaplan’s New York courtroom. Neuborne declines to comment publicly while the Chevron/Ecuador case is pending before the federal appeals court in Lower Manhattan, where he appeared on April 20 on behalf of his clients. But his vigorous, closely reasoned, and biting arguments are publicly available in the two appellate briefs he has filed. He apparently finds it hard to hide his astonishment at Judge Kaplan’s verdict. Neuborne notes that Kaplan’s decision included a sweeping indictment of Ecuador’s entire judicial system, but he reminds the appeals court that it was actually Chevron that argued hard and successfully back in the early 2000s to transfer the case to Ecuador. Neuborne writes that “scarcely a decade ago,” Chevron fought “to send the case to Ecuador by swearing that its courts were fully capable of resolving this dispute justly.” He argues that Chevron should not be permitted to get away with shopping around for a more sympathetic venue. In passing, he also notes that Chevron has not produced “an iota of evidence” suggesting that President Correa has interfered in the case. Neuborne reserves some of his most compelling language for Chevron’s star witness, a disgraced former judge in Ecuador named Alberto Guerra, who testified in Kaplan’s New York courtroom that Donziger and Fajardo had agreed to pay a $500,000 bribe to let them ghost-write the Ecuadoran trial judge’s final opinion. Judge Kaplan accepted Guerra’s testimony as convincing. To hear Chevron’s side of the story, I offered to visit the oil giant’s world headquarters, a leafy 92-acre campus in the San Francisco Bay Area. The corporation declined my request, but Morgan Crinklaw, whose job title is “manager, issues management communications,” did answer my questions by e-mail. In response to Correa’s claim that Chevron is waging a “multimillion-dollar publicity campaign” against Ecuador and its judicial system, Crinklaw said: “If President Correa has evidence to support his claims, he has yet to present it….” And in response to the claim that Texaco “deliberately polluted” the rain forest, Crinklaw answered: “President Correa’s rhetoric is nothing more than an effort to evade his government’s own responsibility for addressing the environmental, social and economic needs of the people of the Amazon.” I asked him how much Chevron had paid ex-judge Guerra; if the company was still paying him; and whether he could put me in touch with Guerra. Crinklaw’s complete response: “In his sworn declaration to the U.S. court, Judge Guerra testified under oath that he was not being compensated for his testimony.” Crinklaw didn’t answer my query as to why Chevron had sold all its assets in Ecuador. Steven Donziger, the American lawyer who is the main target of Chevron’s counterattack, lives on New York’s Upper West Side. In person, he is tall and intense, but also friendly and open. He said that his ongoing status as a defendant in the racketeering case meant that he would prefer to speak on the record by e-mail. The central mystery in this epic battle, noted by many who have followed the case over more than two decades, is simply this: Why didn’t Chevron cut its losses and settle long ago, avoiding the expenses and the damaging publicity of the endless intercontinental litigation? Donziger argues that the case is about more than just Ecuador’s contaminated rain forest. He believes that a victory for the rain-forest plaintiffs would set an important precedent: It would prove the success of a business model that can inspire other communities around the world to confront Chevron and other multinational corporations with some chance of success. Donziger uses the expression “monetize hope” to describe this new business model. He explains that the affected Ecuadoran communities could never have financed legal action on their own—“not even the filing fee for the original lawsuit.” So he and others found investors around the world: American law firms, hedge funds, and other backers. “When there is a recovery on the judgment,” he explained, “many of these individuals and entities will receive their investment back plus a modest percentage of the overall recovery. This is just like thousands of other contingency-fee cases filed every year in the United States and around the world.